Andy is the Training Director and a Principal Trainer of Right Impact Training. Being a dynamic, eloquent, and insightful corporate trainer and consultant, Andy has been designing and delivering people-centred corporate programmes for almost a decade. Thus far, he has personally conducted more than 500 corporate learning programmes with major clients from a myriad of industries in both government and private sectors, such as Electronic Arts, YUM! Brands, National Youth Council, Legg Mason Global Asset Management, National University of Singapore, OCBC Bank, Singtel, Royal Bank of Scotland (RBS), Union Bank of Switzerland (UBS), Pfizer, Bayer Healthcare, Shell, ExxonMobil, Hotel InterContinental, Singapore Land Authority, Chanel, L’oreal, Clarins, Thomson Reuters, and Burger King. Being a humorous and thought-provoking public speaker, Andy is highly sought after by his clients. 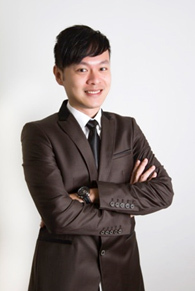 He also possesses extensive cross border experience, having conducted programmes in Singapore, Hong Kong, Shanghai, Taipei, Bangkok, Macau, Malaysia, Indonesia, and Amsterdam for all levels of organisation. Andy was also heavily involved in designing and delivering various high-profile team-based/ facilitation programmes, like Our Singapore Conversation, and with luminaries such as the Prime Minister, Deputy Prime Minister, and other members of the Cabinet Office of Singapore. In addition, Andy is the author of Unleash The Public Speaker In You! and a regular contributor to The Straits Times Recruit. Andy was the highest-rated Emergenetics trainer in Asia-Pacific for 2014, as conferred by Emergenetics International. Academically, Andy graudated with a Bachelor of Commerce from the University of Western Australia and also has a Postgraduate Diploma in Applied Positive Psychology. Andy loves his job and is proud of what he does for a living, because as cliché as it sounds, he gets to change the world on a daily basis, one person, one department, one organisation at a time.